Home Equestrian News Hardin Towell and Pepperpot Top $35,000 Illustrated Properties 1.45m Classic. 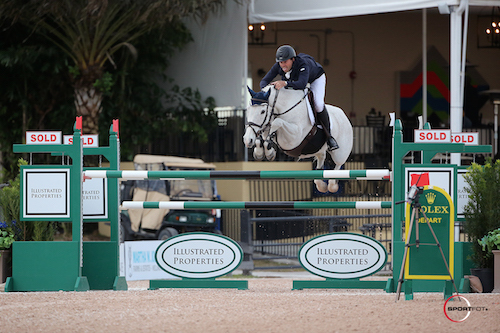 Hardin Towell and Pepperpot Top $35,000 Illustrated Properties 1.45m Classic. The $35,000 Illustrated Properties 1.45m kicked off competition in the International Ring on Friday morning with a win for Hardin Towell (USA) and Jennifer Gates LLC’s Pepperpot. Course designer Luc Musette had 66 entries jump his one-round speed track with eight clear entries. Second to go, Towell laid down a time of 60.48 seconds that would go unbeaten. Shane Sweetnam (IRL) and Spy Coast Farm LLC’s Eregast van’t Kiezelhof clocked in three rounds later with a time of 61.53 seconds to eventually finish third. Richard Spooner (USA) came 54th in the order with a time of 61.41 seconds aboard Little Valley Farms’ Chivas Z to take second place honors. Owner Jennifer Gates purchased Pepperpot, a 14-year-old Irish Sport Horse mare (Heritage Fortunus x Diamonds Are Trumps), following the Spruce Meadows Summer Series in 2015. The experienced mare previously competed under Egypt’s Sameh el Dahan, followed by USA’s Caitlin Ziegler, and Canada’s Tiffany Foster. Towell plans to compete Pepperpot again in Sunday’s $35,000 Suncast® 1.50m Championship Jumper Classic. He might also jump the mare in next week’s Great Charity Challenge, presented by Fidelity Investments®. Previous articleRobert Vos and Carat shone at De Telegraaf Prijs in Amsterdam. Next articleEric Lamaze and Rosana du Park Make it Two in a Row in 2016 Ruby et Violette WEF Challenge Cup Series.